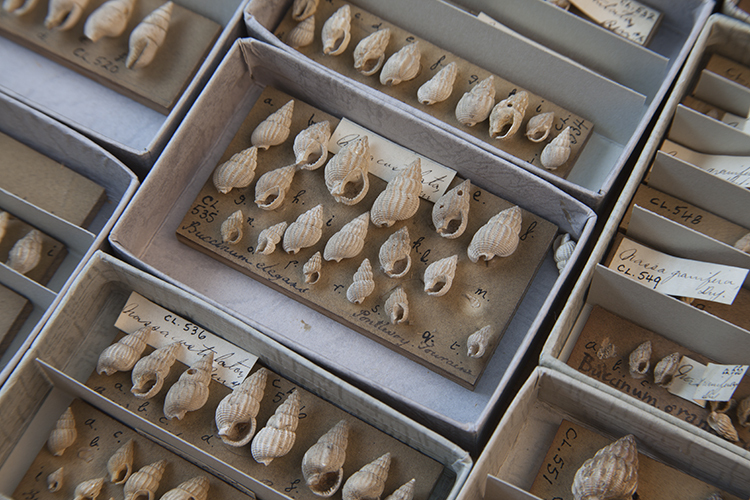 Just over a hundred years ago there was great excitement amongst the staff at Oxford University Museum when they acquired the Charles Lyell Collection of Tertiary molluscs. In his 1903 Annual Report the Professor of Geology, W.J. Sollas, described it as one of the most noteworthy events in the Geological Department that year. The collection contains over 16,000 fossil specimens, mostly molluscs (bivalves, gastropods and scaphopods) but also shark teeth and other vertebrate remains. Although some of the specimens are on display in the museum, few people were aware that we had the collection. It wasn’t until the 1990s that the collection was fully catalogued, and it has never been included in the Museum’s main collections databases. Over the next 18 months we are planning to digitize the collection and create links to our archival material and Lyell’s publications. We want to make the collection accessible to a wider audience (i.e. you) through an image-rich online database including lots of contextual information. At the same time, we will set up a new framework for digitizing palaeontological specimens using the KE EMu collections management system. This will pave the way for the migration of all our current palaeontology databases into KE EMu, joining records from the archives and other specimen collections. These records will all be available on our new Collections Online site. So who was Charles Lyell? Charles Lyell (1797-1875) is best known for his book Principles of Geology, in which he popularised one of the key concepts of geology: “the present is the key to the past”. This book combined his own research in geology with ideas developed by the geologists around him, and provided a foundation for the modern study of the science. Lyell kept updating this book as new discoveries were made and his own ideas changed; in fact the last volume was published posthumously. Lyell read Classics at Oxford, where he also attended the geological lectures of William Buckland. He was a trained lawyer but spent much of his time pursuing his interest in geology, and after 1827 took this up full time. Throughout his life Lyell travelled extensively in Europe and North America, observing geological phenomena, collecting specimens and lecturing to the general public. He was a close and influential friend of Charles Darwin, and Lyell’s Principles was one of the few geological books that Darwin took with him on his voyage on HMS Beagle. On this blog we will be sharing what we discover in the course of this project: about the collection, the digitization process, and Lyell himself. We have a brand new blog to share with you – http://www.charleslyell.com. Just over a hundred years ago the Museum acquired a collection of fossils from renowned geologist Charles Lyell. Lyell is famous for his book Principles of Geology which provided a foundation for the modern study of the science of geology. On the new blog we will be documenting the digitisation of this collection.